Concerned over the political imbroglio which has been dampening the spirit of the Peace Accord Day, the apex student body of Mizoram took up the responsibility and and organised the celebration of the 32nd edition of Mizo Peace Accord Day at neutral venue of Pachhunga University College in Aizawl on Saturday. Peace Accord Day, the most historic day in the history of Mizoram became a political agenda with both the MNF party and the Congress interpreting in their own language. “The day doesn’t belong to any political party; it belongs to the entire people of Mizoram and the day deserves to be celebrated without any political colour, we have made appeals to all political parties of the state to join our melting pot and celebrate the day with fervour it rightly deserves,” L Ramdinliana Renthlei, president of Mizo Zirlai Pawl said. 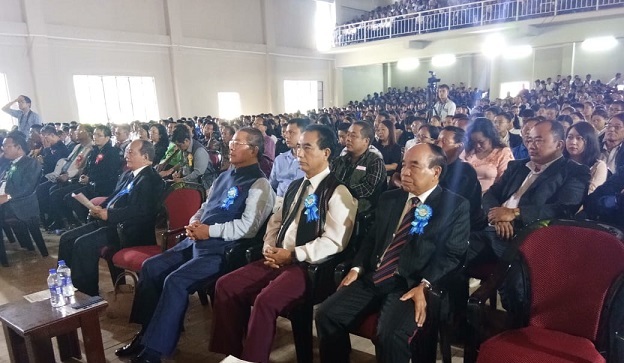 In their effort to add the spirit of the Peace Accord Day, the MZP felicitated the three persons who they said were instrumental in bringing peace in Mizoram – chief minister Lal Thanhawla, former chief secretary Lalkhama and the then MNF president Laldenga. “Laldenga’s philosophy inspired the spirit of Mizo nationalism, Lal Thanhawla gave up the office of chief minister for the sake of peace and Lalkhama’s untiring efforts in the talks between the MNF and the Indian union truly deserves this feliciatation,” L Ramdinliana Renthlei said. L Ramdinliana Renthlei told the thousand strong audiences that the union would continue to celebrate the day in future and that untold stories of the sufferings of the Mizo people during the years of disturbances would be told to the future generations of the Mizos. Accepting the felicitation chief minister Lal Thanhawla narrated several instances of the troubled years saying that he himself was imprisoned for Mizoram’s sake. “The day belongs to the people of Mizoram, we suffered, we died, and we were denied of our basic civil rights, I did what I have to do, hundreds of Mizo youths went underground and they deserved a heroes’ welcome when they came over ground, I gave up my seat for the sake of peace,” Lal Thanhawla said. On June 30, 1986 a peace treaty was signed between the then MNF leader Laldenga and the union of India, MNF came over ground and an interim government was formed which installed Laldenga as the chief minister and Lal Thanhawla as the Deputy Chief minister. Saturday’s celebration witnessed the presence of all the leaders of major political parties in Mizoram. The Mizo Accord was signed by the Mizo National Front (MNF) leader Laldenga, Mizoram Chief Secretary Lalkhama, and Union Home Secretary R D Pradhan. The accord ushered in an era of peace after 20 years of violence and disturbance that hampered Mizoram. On pre-condition of statehood to Mizoram, the Mizo Accord was signed on June 30, 1986. The MNF fighters surrendered en masse and government fulfilled its promise by giving full-fledged state status to Mizoram, along with its own High Court. Under the agreement Mizo was declared as an official Indian language. Mizo religions and social customs were promised Constitutional protection. As per the accord, the MNF agreed to forgo all contacts with other insurgent groups in the Northeast. Mizo Accord is considered to be the most successful agreement with insurgents. The peace established under the accord has been sustained in Mizoram for over 30 years. This is an achievement when the situation in parts of Manipur, Nagaland and Assam still remains turbulent and unsettled.